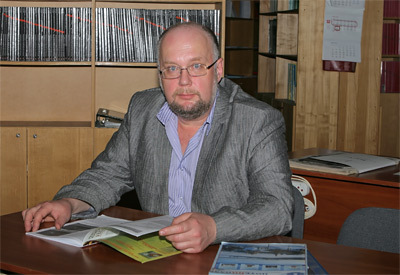 Today’s guest of our 'Formula of success' column is head of the department for technology of nanostructures and devices, vice director for science of the IPM RAS, Dr. Sci in physics and mathematics Vladimir Ivanovich Shashkin. — Vladimir Ivanovich, we traditionally begin our interviews with some personal stories: where were you born, what were your parents and relations? — I was born in 1959 in the town of Vyksa, the Gorky region, to the family of a metal works engineer and a teacher. Mother had worked at school for her entire life since she was 18 and made her way up from a teacher of history to school director. My parents were born in the early 20th century, so they had witnessed and been through a lot. I was a late child (my elder sister is 20 years older than me) and learnt about some historical events that happened in our country in the 20th century from my parents and our older relatives rather than books. My folk came from large and strong peasant families settled on the Oka river. When one of my uncles retired, he set out to trace our ancestry and drew a genealogical tree of the Shashkin family. The lands of our ancestors had for ages belonged to monasteries: they were pretty far out of reach, which, I believe, helped preserve the church archives. The history of the Shashkin family name dates back to the times of the siege of Izmail. It was given to my ancestor Yakov, a saber craft master in Suvorov’s army. He lost a leg at the capture of Izmail (1790) and was rewarded: got a plot of land in the village of Chernichenka of Melenkovskii county Vladimir region, where he settled down and with time acquired a mill. There is some uncertainty about the origin of this name, though: some family legends have it that Yakov was a smith and very good at making sabers, according to other stories he got this nickname («Shashkin” from «shashka”, a saber) for valor and exceptional skill in using a saber. We had many relatives and I enjoyed our getting together. For hours on end I could listen to stories of the family elders about what they had lived through, about our family members, anything. I keep memories of all events that happened to my people, especially in the war times. One of my cousins died a hero’s death at 16 as a junior sailor in the North fleet, there is a street in Vyksa named after him. My uncle survived the war but for the rest of his life he carried a bit of metal stuck in his chest near the heart. My other uncle who was a far-range aviation pilot took part in air bombing raids on Berlin, in 1942 his plane was shot down and he was taken prisoner of war… I once counted that only our two families lost 12 people to the war. My parents' life stories, too, may well be put in a book. It seems they had lived more than one life. My father, on a Komsomol call, took part in the turf harvesting work in Shaturtorf village and earned an honorary title of «champion of the first 5-year plan' (1929-1933). Before the war he finished the military school for aircraft technicians in Perm in the rank of lieutenant-technician. During the war he was involved in transportation of land-lease American planes from Alaska to our country via Naryan-Mar. Then he fought at the 1st Ukrainian front, in the 2nd Air army. His unit mission was to remove shot-down Soviet planes from the frontline and neutral areas and deliver them for repairs. Only the most daring were picked to fulfill this mission, as they had to come crawling beyond the forefront positions under the cover of night. And they also had to come ahead of the Germans. Once a plane was spotted, they hooked it with a winch and dragged, often under the enemy’s fire. Sometimes they happened to rescue a wounded pilot in the plane. My dad returned from the war with an оrder and medals. After the war he got an education and as designer-engineer came to Vyksa for work. He was a man of versatile interests, amazing love of life and full of optimism. His motto was: «All the way up, and up, and higher!'. My mother’s story is just as interesting. — Childhood is a very important period in a person’s life, no wonder we often recall our early years experiences. How were you growing up? What were your major influences? — Of course, it is the family and the place we lived in. Vyksa then was, а patriarchal and very beautiful town, with a long history of metallurgy plants built by the Batashov brothers. Our kids knew that, for example, the wrought-iron fence of Aleksandrovskii Garden was forged at those plants and that the horses on the Bolshoi Theatre fronton were cast there, too. And writer Sukhovo-Kobylin wrote his play «Krechinsky\\'s Wedding' for the Vyksa theatre. We took pride in our town of metallurgists. Everything in it was this way or other connected with the plants. My father worked at one of them, he was an inventor and put forth many innovative proposals. His friends and colleagues often gathered in our place, so since early childhood I was surrounded by technically competent people. And our neighbours were mostly engineers and technicians. Our ground-floor neighbour, for example, fixed TV sets (then tube-based) for the whole town. Almost all people next door were interesting in their own way and easy to get on with, even for us, kids. Another big thing in my life was our family car, I used to help my father in the garage since childhood. My love for motors is life-long, now I am the «chief automechanic' in my own family. I should say, though, that this passion for auto technology went side by side with a keen interest in radio engineering. It was stirred up by our physics teacher: her classroom was full of technical gadgets we made with our own hands. The «Radio\\' and «Do-It-Yourself\\' magazines were my favourites. At that time it was already possible to get some radio parts, some components could be ordered through the Posyltorg purchase and delivery service. The variety of devices we then assembled was amazing: receivers, amplifiers, radio stations, later came light-and-sound systems, and so on. It is surprising that some self-made gadgets served us a very long time. For example, the electronic ignition uncommon in those days, that I made in 1973 when our family got a VAZ-2101 car, had been in good use till mid-90s. I can tell a lot about my school teachers. It was a generation of people devoted to their profession, with dramatic life experiences, many of them were scorched by the war. Our teacher of the Russian language, for example, with a year-old baby in her arms had only by some magic escaped being shot during the German occupation of Belorussia. The biology teacher had for three years been in the batallion reconnaissance. But the most important thing is that our teachers loved what they were doing. It was a happy time. I finished school in 1975 with a gold medal, having skipped the 3d grade in the elementary school. — Аnd still, what influenced your choice of profession most? — I think I could have landed the automobile industry, had I not decided then that there was no more to be done in this field. I came to this conclusion after I'd read a lot of technical literature. Аnd for microelectronics, I thought, there was a bright future in store! That is why for three years I additionally studied by correspondence at the Moscow Physical-Technical Institute and Moscow State University schools for secondary school pupils. This form of education was offered by all major institutions of higher learning, but on leaving school I chose the radiophysics department of our Lobachevsky university rather than go to Moscow for study. — What was good about your student’s life? — At the university we had a good tourist club. It was there that I acquired not only the skills of proper and confident canoeing on rivers of various categories of complexity, but also the experience of a group leader on such tours. Water tourism, white-water rafting and canoeing came to be my main hobby. We went down the rivers in the Altai, Sayan, Caucasus and West Ukraine mountains. 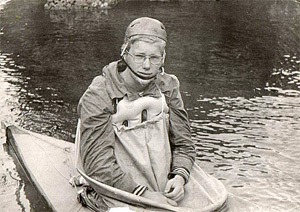 I had mastered canoeing on rivers up to the 5th category of complexity. The most remarkable thing, of course, was that in my first year at the university, at a lecture on bibliography I met my future wife, a student of the computational mathematics and cybernetics department. With time she, too, «caught\\' this «tourism virus'. It was a special time of our feeling complete happiness and we looked forward to it all through the year. It is impossible to forget… Like, for example, when you wake up the earliest in the morning somewhere in the Sayan mountains because it is your turn to make breakfast, and see the mountains in front of you, the fog hanging over the river that abounds in fish… But that life was not only about such romantic moments. I still keep diaries of our tours, which show how a minor mistake or lack of discipline in the team could end up in a struggle for survival. It is a rather severe sport. In my graduate years I was attracted by martial arts. In our city these practices were not that available then, but as we assisted militia in the safety control of railway transport and the Militia School was supervisor of our komsomol group we were allowed 3-hour workouts in their gym to 5 times a week. We had a qualified coach who gave us lessons of Wado-Ryu («The harmony way' in Japanese). It was fun! — Didn't such active life distract you from study? — It was, rather, a change of activity that made life more exciting. I graduated from the university with honors. And in my fourth year I already knew I was going to work at the Institute of Applied Physics of the USSR Academy of Science, so I was in no position to slacken off. — Аnd how did you get involved with semiconductor research? — I weighed my chances again. When it came to choosing a theme for my diploma project, I considered the situation in the field of high-power vacuum electronics and decided that it was too crowded and they had already done almost all there was to do there. And the most promise, I thought, was to be expected from semiconductor electronics: there were ideas in the air that needed to be realized. I did my diploma research under the supervision of А. М. Belyantsev and later came to work in his department at IAP after graduation from the university in 1980. The priority trends of research in the department headed by А. М. Belyantsev and А. А. Аndronov were concerned with development of new sources of electromagnetic radiation in the millimeter and submillimeter ranges on the basis of semiconductors. There were several approaches to solving of this problem. I joined the group engaged in the study of semiconductor quantum superlattices. In our city there was a strong theoretical school in this area of research. My guides into these problems and this research community were Yu. A. Romanov (then Director of GIFTI) and A. А. Ignatov. The work proved to be very interesting, the theoretical group was joined by experimentors and technologists. For me the participation in this project resulted in defending a PhD thesis. Along with the research I embarked on an active social work at the institute. — What kind of work? — For a few years I was secretary of the komsomol organization at IAP, member of the institute and regional Councils of young scientists. Besides organizing leisure time activities we arranged meetings with the institute’s leading scientists, held informal disputes. Young scientists at IAP RAS have always been given much attention to, and the Council of young scientists in itself was very productive: we used to read scientific articles, shared opinions and information, discussed new events in the world’s science. Once we even initiated a joint meeting of young scientists with the «big\\' scientific council, at which the young were given an opportunity to speak out about what research trends, in our opinion, should be developed. By that time good experimental results had been obtained in our department through a joint research with the Ioffe Physical-Technical Institute. It was clear that for successful development we needed our own semiconductor epitaxy technology, and I voiced the idea at that joint council. It was met with enthusiasm, it was obviously a long-standing issue. Soon high-temperature superconductivity was discovered and the pioneering results were instantly reproduced in the department of S. V. Gaponov. This apparently was the key reason why a decision was made to organize a special design and technology bureau (SKTB) at the IAP and construct a building on a new site. It was the beginning of the semiconductor epitaxy technology development in our institute. — It was then, I believe, that your administrator’s career began? — On defending my PhD I worked as a junior scientist but not for long — less than a month, actually. In June 1988 an order was issued that a department for semiconductor and superconductor technology (С-30) be organized at IAP, and I was appointed its head. Building a new department proved to be a hard job because only two daring guys, S. A. Pavlov and M. N. Drozdov of IAP AS transferred to this technological division, others had to be sought for elsewhere. Besides, we had neither equipment, nor experience. But already in 1989-1990 we did the first R&D work based on our epitaxial structures. 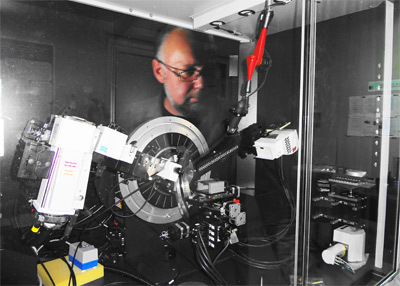 Rapid development of SKTB led to the organization of a full-scale department for solid-state physics at IAP AS. It happened owing to the unflagging energy of the department’s director, S. V. Gaponov, and his team of young, resolute and enterprising deputies, A. I. Kuzmichev and А. А. Gudkov. А. А. Gudkov and his colleagues were, I believe, the first group in our country to have produced scanning tunneling microscopes and in the early 90s they launched successful production of these devices on a level with the now well-known NT-MDT company of Zelenograd. I joined the team of deputies-Director at the beginning of 1992, aspiring to contribute towards carrying out of our main mission: world’s level research into the physics of solid state, based on the cutting-edge technology and equipment. — I would say, you have been moving pretty fast up the career ladder. How do you manage to reconcile your research and administrative work? - It is not that easy, really. The fathers-founders of the Nizhny Novgorod scientific school of radiophysics: А. А. Аndronov (Sr.), G. S. Gorelik, M. T. Grekhova, A. V. Gaponov-Grekhov in their time did not pay due attention to solid-state physics and it «grew up' as a wild sprig on an amost virgin ground. We had to catch up with the leading research labs and institutes. The hardest thing was (and still remains) to furnish the R&D process with modern equipment. When we were getting started, research equipment was not available for money, it was allocated among different funds and had to be «knocked out' (popular slang of the time) of them, which took a lot of time and effort. Then, we had to search for money, which was not easy either. There is a year in my research life in which I did not have a single publication, and it was the year when our institute was being organized. I thought that administrative work was important to my self, that no one would do it for me. S. V. Gaponov once remarked: if you are unable to solve a problem in your current capacity, go further up in your career. I held the position of deputy-director for science at IPM RAS in its earliest period and later became director of the Center for Common Use of Research Facilities «Physics and technology of micro- and nanostructures'. I keep working towards expanding our measuring and technological base, now for the entire institute. — What are your guiding principles when you set yourself a research task? Аnd to set a genuinely fundamental problem one must have the courage fueled by unquenchable curiosity, which is best illustrated by a well-known tale I can’t but mention here. Neil Armstrong was allegedly asked at some meeting about the true reason why they made that flight to the Moon. He started telling the well-learnt story about the tremendous significance of the Apollo-11 flight for science, then paused and said: 'As a matter of fact, there is only one reason, you know. The Moon is out there and we are here'. — Could you tell about some of your developments in greater detail? — For a few years now we have been involved in developing high-sensitivity elements for detectors of millimeter and submillimeter radiation. This range of wavelengths corresponds to terahertz frequencies (1 THz = 1012 Hz). We have developed original planar detectors on the basis of thermal-field tunnel diodes that ensure high sensitivity of detection in this range. Since planar detectors are fairly simple of structure, they were used as a basis for development of multi-element matrix receivers that make possible recording of the THz intensity patterns. With a lens and a matrix we can realize a system of radiovision at THz frequencies in real time. The difference in the materials transmission and reflection properties in the terahertz and visible ranges allows us to extract more information on the object in question. Many household materials are transparent for THz radiation, so it is in principle possible to see through objects. This technology is essential in such applications as defect detection, customs inspection, prevention of terrorist acts and for solution of many other problems. We now have a few working prototypes of the device and hope to bring its next realization to a higher-technology and wider-applicability level. — Has integration in the world’s science taught us any lessons? — There is a joke about three stages every scientific research goes through. Americans first take out a patent on an invention, then it is found out that its main ideas were published by the Russians about 20 years earlier, and in, а couple of weeks the news comes that the Japanese launched production of a new product relevant to this patent. We are surprisingly unable to put our research results to our own good use. The practical value of a scientific research must be given greater priority. Of course, it satisfies to be solving problem after problem and have articles published without pursuing far-reaching goals. It makes life easier but, in my opinion, is the main thing our academic science could be reproached for. We must attach more value to the practical importance of scientific research. — What is the role of a science manager do you think? — The present system of grant-based support of science naturally offers ground for shallow theme projects by individual grant seekers, that is to say, everyone «sings their own song'. This situation, I believe, must be opposed by science management involving recognized scientists in administrative positions. Our science is team-based, and it is this tradition of collective research that gave rise to and sustains the scientific schools in our country, whose value, as A. V. Gaponov-Grekhov always says, cannot be overstated. And this is true, because the integrating commander or boss management ensures a higher competitiveness of a research group in a struggle for major projects and government contracts. One example is our resource pool (CKP) set up at the IPM RAS about 10 years ago. Having such a structure at the institute helped us win a few major lots of the RF Ministry for education and science and to noticeably upgrade our material and technical base. We acquired high-technology unique equipment, which takes our R&D work to a radically new level. And this, too, requires competent management. — Аnd what do you think about the adopted resolution on science managers training in a higher school? — An effective manager for industry or banking sphere can be trained at a university or a business academy. Defense minister’s job can be performed by a civilian. But a science manager must be a man of science, no doubt. They must be able to understand the significance of results and achievements, to set new goals and motivate the research team. If science management rests only on external indicators (number of publications and scientific degrees, citation and other indices, etc. ), it will hardly be effective. — In your opinion, what personal qualities are essential for this job? — I share the opinion that a science manager must be a recognized scientific authority with the ways of a dictator. This person must be hard enough to stand against a research problem being diffused and branched out into separate, less important investigations. Besides, there are other responsibilities, like providing for the colleagues' needs, creating a working atmosphere, diversification of profits, reasonable investment in the future of the research group. After all, one has to be able to make the bed so one can sleep on it. — Do you have any spare time? What do you do at leisure? — I have little free time left, so I like to spend it on my village house in the Bor region, no more canoeing or martial arts, of course. I built this house mostly with my own hands, from the cellar to the roof and from the water supply to electric wiring. Last autumn I finished decorating the stairs to the second floor, it is delicate woodcraft rather than carpenter’s work. I have a wide variety of instruments and enjoy construction work. It is the state of mind. When I am finished with my house, I will start building something else. There is also the river, the forest, mushroom picking. And my other passion, the autos. In winter I ski and I wish I could go to a gym and a swimming pool more often. — What do your children do? — My daughter graduated from the Nizhny Novgorod university with two diplomas: in computational mathematics and cybernetics and in economics that she studied simultaneously at the mechanical-mathematical faculty. She is an IT specialist and lives in Moscow now. My son is also a CMC graduate, at present he is getting his second higher education at the Higher School of Economics and works as a manager in an advertising company. He likes to shoot films there and it looks like he is quite good at it. — Have you got any motto? — There is a nice Bulgarian saying: «Вълкът му е дебел врата, защото си въерши работата сам', i. e., a wolf’s neck is so strong because he works a lot by himself. It is pretty close in meaning to my life motto. — Thank you for an interesting talk.